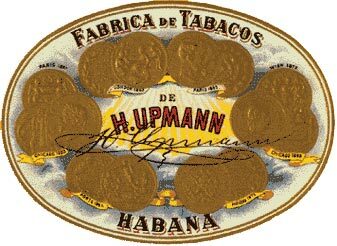 The "H. Upmann" brand was introduced on 15th October in 1844. The developers of these cigars were brothers Hermann and August Hupmann. They never dreamed that this brand would become so popular. The demand on "H. Upmann" cigars was very high and it is still the same. This brand is appreciated by smokers who prefer very strong tobacco. The cigar has dark wrapper, which stresses its flavor and fragrance, giving it a sweet and spicy note. In the 20th century these cigars were very successful in Germany where they were served in silver salver. In our days this brand is highly appreciated in England. Today H. Upmann Factory is the Parent Company of the renowned Habanos Montecrist, Diplomaticos, and the pioneer of H. Upmann firm. These cigars have charming appearance and they are produces in different sizes.